"Neo-Decadent writers will honour the fragmented, the contorted, the unfinished, the unpublished" writes Brendan Connell in his manifesto. 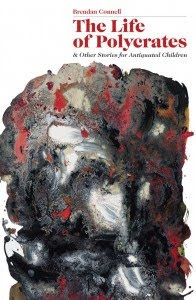 With the obvious exception of the latter, many of the stories in this collection fit the first three categories, although to call them "unfinished" might seem churlish. I wouldn't want to suggest that they are unfinished in the sense of having splinters and unvarnished surfaces - clearly a great deal of attention has been paid to getting the tone of each piece right, and generally these efforts are successful. But quite a few of the pieces end on an arbitrary tangent or drift into a fantasy. Again from his manifesto: "Story arcs should only be used to hang oneself with. Nothing is ever resolved. Nothing progresses." That's not always true in life, or in this collection. Many things progress: tumours, obsessions, men's fates accumulate momentum, leading to their ultimate downfall. Connell has indeed studiously avoided any traditional open-and-closed story arcs. In fact, some of the pieces can hardly be called stories at all. In some cases, the possibility of a story is all that is glimpsed behind layers of obfuscating fragmentary texts and references. "The Search for Savino" begins in typical gothic style with dark hints at the peculiar habits of an obscure artist related by one collector to another. But the narrative quickly breaks down into a series of lists, catalogues, letters, dialogues and transcripts of interrogations. Somewhere behind all of these partial evidence there may be a story, but Connell is not going to give us enough clues to work it out. There is something to do with painting on skin, on eyelids or eyeballs, but that's as close as you're going to get and, one suspects, if that frustrates you then you've missed the point. The title piece of book is by far the longest. From my initial bafflement at what seem to be invented "sigla" (e.g. "conjectural conceptions" or "offstage comments") and the slight irritation with which I always meet untranslated quotations in languages that I cannot easily translate, I began to get a sense of what the text was pretending to be. Taken partly from classical sources (such as Herodotus), "The Life of Polycrates" sometimes does just what it says on the tin, narrating the rise of fall of the tyrant of Samos in an approximation of the exotic austerity of classical Greek style. But the straightforward narrative is interrupted by fictional fragments of epistles, excerpts from the catalogues of libraries, lists of the contents of a dressing case, ancient graffiti. There are absurdly lengthy footnotes to rival Flann O'Brien's asides about De Selby in "The Third Policeman". Connell seems to revel in playing with the architecture of academic discourse: the "sigla", when the do make their appearances, seem arbitrary, there is a great deal of indentation, numbered and lettered lists and chronologies. It's an epicurean tale too, which delights as much in the descriptions of feasts and of unusual dishes (e.g. fried daffodils), of the perfume of young men's oiled hair, of the exotic specimens in Polycrates' garden, as in the actual plot, which feels of secondary interest. Connell is more interested in the texture of ancient Greek life than in ancient Greek lives. Clearly a huge amount of research and a lifetime of erudition has gone into so dense a piece, but occasionally the tone is betrayed by an out-of-place chattiness: "a boat-load of goodies" does not strike me as a line that could have been lifted from Herodotus, if that is the intended effect. Elsewhere "The Life of Captain Gareth Caernarvon" recounts the adventures of a nineteenth century English Colonial, hunter, transvestite and uber-carnivore that wouldn't have looked out of place as an extended Monty Python sketch (with Graham Chapman as the bewhiskered and corseted Captain). Less successful is "The Slug". A handsome man deliberately sets out, over the period of his lifetime, to make himself repellent, for reasons we cannot properly understand. Here Connell's use of sentence fragments and single sentence sections seems self-indulgent and designed to shock. "Section VIII" of the story simply reads, "The colour of vomit", which is neither shocking nor interesting, merely adolescent posturing. Connell has a gift for the kind of phrase that looks out of place, but which nevertheless jolts the reader to attention. In the otherwise unexceptional piece "Molten Rage", the narrator looks and the traffic and describes "men willing to kill, not only each other, but babies, old men and women, in order to feed these creatures in whose bellies they perched like half-digested herring." Neither does he shy away from raiding the dictionary for what primary school teachers now call "Wow Words": altocalciphiliac, acousticophiliatically, frotteurism. Usually I raise my eyebrows at this kind of extravagance, but Connell does it with such chutzpah that in the end I gave up minding. In "Collapsing Claude" a bank clerk becomes addicted to an emasculating, obese and sexually voracious woman. In a superficially similar piece, "Maledict Michela", an elderly German man falls for the magnificent ankles of a similarly poisonous female, but in this (superior) story the battle is more poised, and the story takes an abrupt corner before ending at a Chekovian impasse as the German husband's immunity to his wife's spite leads to the last line: "She despised him. Her walled-up spite was for him the very fountain of youth." As in his other books, Connell is only interested in extreme characters, wholly gluttonous or predatory women, completely spineless, abject men, or impossibly, fantastically carnivorous. There's also a common thread of disgust for crowds, for the mass of unremarkable humanity, which many of his self-marginalised characters share, and which seems vindicated by the last line of "The Slug": "Everyone is vulgar". "There’s nothing wrong with writing a lousy book," states point 10 of his manifesto. Just make sure it’s really lousy. There is nothing worse than competence." This book is by no means lousy, and Connell is too addicted to risk-taking to risk mere competence. I didn't think all of the risks paid off, but I'm glad he took them, because without the deliberately grotesque stylistic flourishes, and the fragmented textures, the thinness of the characters and conceits would have been glaring. Like a bike ride in the Lake District the terrain of this book is uneven almost to the point of fatigue and irritation. There are one or two nasty ditches, but the views from the tops compensate. The Life of Polycrates and Other Stories for Antiquated Children, by Brendan Connell will be published by Chômu Press on the 23rd March 2011. Pb 266pp. Available from Amazon UK. I edited this review slightly! Corrected one or two typos, tried to make it a bit less pretentious. The sky is falling! PS Publishing publish ebooks!